When it comes the time to choose a skin for a magazine site, well crafted and wisely structured design is often the most important factor. As usual, such sites are content heavy and require thought-out structure of the layout to present all information in an easy to perceive way. You’ll get all this with a modern stylish magazine Magento theme that is created in accordance with the latest design trends like large hero areas, blurred image backgrounds, emphasis on typography, big call to action buttons and, of course, orientation on users. Isn’t it a good idea to let people involved in the art displaying their portfolios on the web? If it sounds awesome to you, this template will come in handy. As it is easily customizable, you won’t find anyone who wouldn’t appreciate this product. Using it will give you an opportunity to intrigue visitors of your website with various examples of creative works placed against a light background of its color scheme. If someone gets interested in a certain piece of art, a shopping cart in the corner of every product will give a hint at what to do next. Losing potential customers will become almost impossible with this template. Quistreis a fully customizable and feature-rich Interior Magento Template that will help you get your online business started hassle-free. Running on a fully responsive framework, the theme was designed in a clean and minimalist way, which is intended to bring your store’s products to the forefront. Bold images, categories accordion, video integration, cloud zoom, hover effects, and creative content positioning are intended to provide for better visual appeal and enhance the usability of your site. With the purpose to help the web users reach the desired products with a click, the theme’s header features a sticky MegaMenu. Clean and stylish design of this Exterior Design Magento Theme looks highly aesthetic and calls the sames emotions. The visitors will enjoy pleasant visual experience while browsing your site based on this theme. Easy shopping will be offered by a wise arrangement of all products in grids, their division into categories, site wide search, and intuitive navigation. Large header image and retina-ready photos add a vibe to the overall look of the layout and work as strong visual triggers that drive people in. You don’t need to be a pro coder to modify this theme. Its comprehensive documentation will help you do it effortlessly. 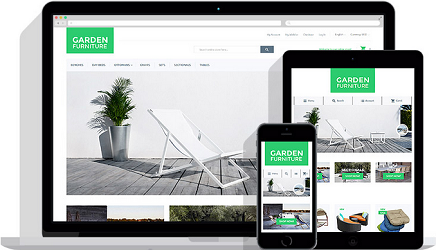 Furnitex is a responsive Garden Furniture Magento Template, created for garden furniture store websites. Feel free to work in different browsers with CrossBrowser Compatibility. Manage the content filling and structure in any way possible with a fully editable fixed-to-the-top of the page MegaMenu. “Hot” and “New” badges added to the products displayed on your site draw the users’ attention to the featured items once they land on the page. Ajax Search allows people to look for the desired content by means of a keyword or phrase. Multiple Sorting options, Newsletter pop-up and Multilanguage will make your website far more user-friendly. Metaine is an elegant and clean kitchen supplies Magento theme designed for kitchen appliances, cooking utensils, bakeware sets and more. Apart from design, Metaine can boast a collection of useful modules that come with the template absolutely free. With Megamenu module you can power up your website’s menu by highlighting your entire assortment with the help of category links combined with images. A smart product sorting option enables your viewers to choose how they want to navigate your products based on the number of products per page, order, type of product, product view, etc. A fully responsive and well-documented magento 2 theme is your match if you’d like to highlight the specialty of your house decor online store. TM Banners Grid Widget will make an outstanding presentation of your store offers and promotions with the help of up to 6 beautiful banners at the same time. An elegant Product Carousel will help you to showcase your featured products in a stylish way, while star rating will make interior decor products look more catchy. Music plays an important role in people’s lives. It raises our spirit when we are in blues and washes away all pains, like a pouring rain washes the dust from the sidewalks. We can frequently observe a rainbow after the rain. When the music is over we stay under its magic for some time. Many musical instruments are made of wood. So, dark wooden texture in the background is highly relevant for a music store and is associated with quality, professional instruments. A slider in the template creates the atmosphere of a cool rock bar where people can enjoy the greatest hit in live performance. This template can be your favorite among other professional items of Best Magento Themes 2014. Chic presents decor, stylish accessories for gadgets, fashionable clothes it’s all possible with prints. Printing companies bring into life hundreds of clients’ dreams every day, and if a site for the one is a matter of your interest, make people want to choose your presence among others. To present all services, showcase products and make target audience interested in them, feel free to use this minimal theme that is centered around a flat design approach. Bright, colored elements are highly relevant for such kind of store categories. Rainbow colors look even more vivid due to the neutral background. Sale items are showcased in the slider gallery. Promo banners surround it from right and bottom sides. Featured products come in four columns. Light blue ‘Add to cart’ buttons look very cute. Newsletter subscription form as well as social media options can be easily found in the right bottom corner of the page. Make a click and this cheerful design may become yours. With the growing number of online music stores, you need to set up an outstanding resource that would provide people with the richest collection of tracks on the web. This theme will help you with this. Its simple layout guides users to the product that best suits their needs, whereas the navigation sidebar moved to the left makes it easier to find various artists and genres. Thanks to the use of light grey and black color scheme with vibrant red accents, users will focus attention on the meaningful areas and feel the excitement to navigate through your site and add a bundle of tracks to the cart. Build a functional and modern shop with this powerful music store Magento theme. It comes loaded with a full-width slider in the header section where you can post photos of the latest albums and arrivals. Vertical mega menu is one of the greatest features of this template as it provides a user-friendly navigation. In such a way, visitors will be able to find the products they are interested in much faster. Responsive design ensures your website performs good even on fourth-screen devices. This template can be your favorite among the list of The Best Premium Magento Themes 2016. Its design also boasts a large background image, which will help you introduce your e-store effectively and stimulate shoppers to browse through its inventory. This wedding stuff Magento theme has a newsletter signup popup to increase the number of your subscribers. Supplied with images of wedding gowns and descriptions, a mega menu will take the navigation of your eCommerce site to an advanced level. Slider shows gorgeous brides in wedding gowns from the latest fashion shows. Big banners advertize the latest wedding dresses collections. Featured products are supplied with the hover effect. This considerably saves the space on the page as call-to-action buttons and star rating appear on mouse over only. Social media icons and additional menu are at the expected place, at the bottom of the page. You can find this template among other items of The Best Premium Magento Themes 2016. Huge full-screen slider shows latest summer sunglasses collection. Big beautiful banners enhance main navigation menu and promote store sales and discounts. New products are supplied with stickers . On hovering the items a lot of additional information becomes visible including call-to-action buttons, star rating, prices, descriptions and ‘Quick view’ option .